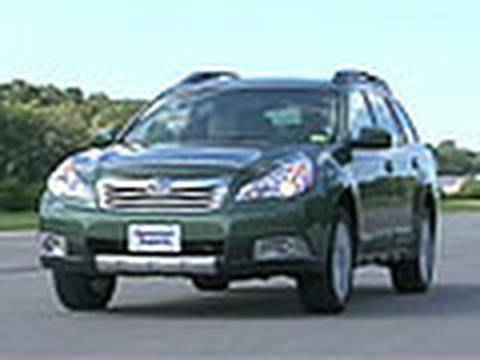 Although cosmetic and powertrain enhancements lie ahead for 2013, the 2012 Subaru Outback continues to be a formidable force in the mid-size crossover realm. Comfortable, refined and exceptionally capable on road or off, this self-proclaimed "world's first sport utility wagon" offers the choice of 4- and 6-cylinder horizontally opposed engines, each backed by the automaker's symmetrical all-wheel drive system. A zippy car for fun times. My car is comfortable and reliable and performs well. I bought it when I lived in Seattle, Washington, because I lived on a hill and it performed well getting up our hill when it was icy. It was a popular car in Seattle where everyone had an outdoorsy lifestyle and we often drove on hills and in the mountains. The car has a hatchback which was good when my boys were St home for hauling sports equipment, instruments and backpacks. It was also helpful for carrying large amounts of groceries. I amid felt it was a safe car for new drivers. Seattle is a crowded city and it is often difficult to find parking. My car was easy to park and got into smaller spaces. When are boys we’re out of school and living independently we moved with our car to Philadelphia, Pennsylvania. We drove the car from Seattle to phalli. It was 4 years old then and it performed well on the trip. We had room to take some of our more fragile possessions that we didn't want to risk sending with the movers in the moving van. We completed the trip without problems. However, my husband complained that the driver’s seat irritated his sciatica. He became very uncomfortable every time he drove for more than about an hour-long shift. This resulted in my having to do a lot more of the driving than I would have liked to do on that trip and on other trips since then. Now that we live in Philadelphia, I would like to replace the car with one that has a trunk. I worry that my car will be broken into and things will be stolen. Also, since my husband takes public transportation to work here, he does not have a car. Now that we have only one car, I would rather have something other than the Outback. I would rather have something roomier and a little more upscale to drive visitors and friends around in. The perfect car for your outdoor pursuits! This is by far the best vehicle I have ever driven. It is reliable in all weather conditions and handles particularly well in snow. The Outback is the best model if you are looking for something low mid-size, yet large enough to carry big items (especially for the outdoor enthusiast, it is great for all types of outdoor gear). The smaller liter engine gets exceptional gas mileage, but I would consider purchasing the larger liter engine if you are interested in more pick-up. Overall and exceptional buy - I will continue to purchase Subaru’s. Subaru: reliability, safety, proven value. As you may know Subaru has long been known for its reliability. I have owned this car for 2+years and have only changed the tires and the oil. It has never once gave me a problem other than normal maintenance of the car. I would strongly recommend a Subaru to anybody I know. It fits my family of 4, it is very safe with side airbags standard, as well as there intuitive AWD system that has proven year after year. The gas mileage is between 20-25 mpg which is not bad considering its spacious interior and room for 5 comfortably.